Intel and AMD's announcement means more competition for Nvidia. Here's our take. AMD and Intel just announced early today a major partnership, combining Intel's CPU technology with AMD's graphics. The move came as a complete surprise, and has potentially far reaching ramifications. Here's what we think some of those might be, and how two big players joining forces might affect PC gaming. Jarred: There are several facets to this story. First, in speaking with AMD and Intel, it's clear this isn't the death knell for all Intel Graphics solutions. This is designed to take over for the existing H-series SKUs, which basically is Iris Plus/Pro. Those GPUs are only found in higher-end solutions, like the quad-core mobile chips, or in Apple's laptops. I don't see Intel dropping its entry level HD Graphics solutions any time soon. Looking deeper into the announcement, Intel specifically mentions the pairing of HBM2 with the integrated graphics solution. Again, that's where Iris currently exists, and to be clear, Iris is a really expensive (from the manufacturing side) solution. It bundles a relatively large eDRAM chip into the package, but the increased bandwidth still isn't going to turn a low-end GPU solution (HD Graphics GT3/GT4) into a gaming powerhouse. Part of me would love for Intel to shelve its graphics department and just put the money into licensing a proven solution. But even if that were to happen, Intel would need to maintain drivers for years to come—its HD Graphics solutions remain the 'most popular' GPU by a huge margin, thanks to the fact that they're in every major CPU Intel has manufactured dating back to 2010. So we can just forget about that. But as a mainstream to higher-end gaming solution (we'll have to see how it performs when the parts launch), replacing Iris Pro with something better is definitely needed. Tuan: I know the announcement is mainly focused on laptop solutions, but I have a hunch this will go further, maybe even into desktops. There are a lot of low to mid-range desktop solutions that can benefit from an Intel CPU with high-performance Vega graphics. Jarred: You mention Vega, so let's talk specs a little bit, or at least what we can guess from the information released so far. In speaking with AMD about the chip, this is basically in the same product category (from AMD's perspective) as the chips in the various Sony PlayStation and Microsoft Xbox consoles. Intel will be the one to deliver the full specs, if and when it's ready to do so. But one thing AMD was quick to point out is that this is a 'fully custom solution,' meaning it won't match up perfectly to existing parts like Vega 10 or Polaris 10. Here's what we do know. Intel has to have the chips already—they're going on sale in a few months, and testing and validation needs to be well underway for that to happen. So despite the inclusion of a 3D rendering of the chips, I would say that the rendering is there to obfuscate specific details rather than because the chips are not yet ready. Being a rendering means that the chip sizes aren't necessarily 100 percent accurate, but we still get at least a good idea of how it will work. There's a single, smaller Intel chip on the right, which would be the CPU. It's possible Intel has created a custom variant of Coffee Lake or Kaby Lake without any integrated graphics, but I doubt that's the case—more likely is that it will be fused off on the parts that use the AMD graphics solution. On the left, we see the two parts of the AMD graphics. The smaller chip has the dimensions of an HBM2 stack, so this will likely feature a single HBM2 module. HBM2 does support multiple stack densities, so it could be anything from 2GB to 8GB in capacity. AMD's Vega GPUs currently use 4GB or 8GB stacks, and given this is supposedly a high-end graphics solution, I wouldn't expect anything less than 4GB VRAM. 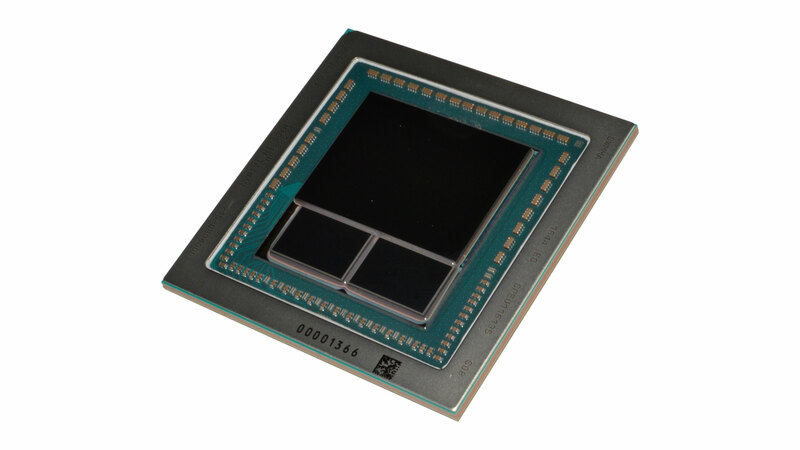 Moving over to the biggest chip on the package, the AMD GPU is quite large, particularly for a mobile product. This can't be a full Vega 10 equivalent with 4096 shader cores, as looking at the Vega GPU implies a chip at least twice the size of the one being used by Intel, but we could conceivably be talking about 2048 shader cores. But again, it's a rendering that might not be fully to scale, so really it's going to be in the range of 1024-2048 cores. With 1536 cores plus HBM2 memory, that would put performance somewhat below the RX 570, but well above the RX 560, which would still be a good spot for a thin and light gaming laptop. Power use remains a question mark, but tweaking the architecture and clockspeeds can do wonders for chip efficiency (eg, the R9 Nano). And that's about as far as we can go right now on the specs. One final piece of information is that AMD doesn't view this as a threat to the mobile Ryzen APUs. Those are designed to compete in a lower performance bracket, both on the CPU and GPU fronts. Ryzen 7 APUs will have 640 shader cores, with a 4-core/8-thread CPU, so it shouldn't be too difficult for Intel to beat that with their 4-core/8-thread CPU and a 1024 core (or higher) AMD GPU. It will likely end up priced higher than the Ryzen 7 offerings, though that all remains to be seen. Overall, this is really exciting news, and I agree we'll see this make its way into desktops—or at least all-in-ones—in the future. We'll probably see this chip at CES in January, based on what I've heard today. Tuan: This is one of the most exciting pieces of hardware news in the last decade. I feel like I’ve been a broken record when speaking to people about innovation in the hardware space. While it’s true that AMD and Intel have partnered before, today's announcement is a bold move for both companies. First, it signals to me that Intel doesn’t believe its graphics solution has any more legs. It’s run its course in terms of performance. While Intel's Iris Pro is pretty decent for low to mid-range gaming laptops—Steam user stats indicate Intel graphics to be hugely popular—it won’t do for higher end gaming. Second, AMD’s CPU cores (which are also in its APUs) are still weaker than Intel’s mobile solutions, but AMD’s graphics solutions are much stronger for gaming laptops. So this move for me between the two companies signifies an exciting change and I welcome it. But it also means this could be the death of Intel integrated graphics, at least for the next three to five years, if not more. Does this mean that an Intel and AMD based gaming laptop will outperform a laptop with a discrete Nvidia GPU? Probably not. But what it does mean is that for performance per dollar, you’re going to get a helluva lot more graphics performance for your money. It means you won’t have to spend the premium dollars to get a much higher-end experience. A win for laptop gamers. Nvidia got back to us saying it had no comment to make. But I reckon the company doesn’t feel too threatened in the high-end space. To Nvidia, its branding is strong, and most gamers who don’t care too much about hardware specs often just want their gaming rigs to to have “GeForce” and “i7” in their machines. The main impact would be in the mid-range and value products, which is still big business for Nvidia. Many gaming laptops ship with 1080p screens, and I feel an Intel and AMD solution will deliver exceptional value in this category.